UK is the most favourite choice to import used luxury cars. We all want to be a proud owner of one of the brand new or used luxury cars that has the best features but are never sure which luxury car and the features we want. Rather than having to go online and seek each and every vehicle on the planet. There are major car brands that have the best features of vehicles coming as standard parts. Even when it is a second hand car, it will be worth it. UK Auto Exporters can source and ship used luxury cars. We can source and export the British Prestige used Rolls Royce, used Bentley & used Range Rover. As well as German Crafted used Audi, used BMW and used Mercedes Benz from UK or Germany. British and German luxury cars come with the best safety features any vehicle can have on the planet. The full set of airbags, collapsible bumpers, tyres that can still work even when flat and steel skeletons that will ensure you remain safe even during an accident. All the UK used luxury cars, including used Rolls Royce, used Bentley and used Range Rover which are for sale in UK have passed all the safety requirements. This is a surety that will keep the user safe in most normal accident situations. UK Auto Exporters export high value used luxury cars like used Rolls Royce and used Bentley that are more popular than other vehicles. The fact that they are second-hand but still cost much more makes it easy for one to conclude that they have a higher resale value than their other counterparts. With these kinds of vehicles, you can own one and still recoup a large part of its value when you sell it off. When you own one of the vehicles in our portfolio, you have the chance of having the bragging rights that come with the prestige of owning a luxury car. With our used luxury British & German cars for sale in UK, you get to make a name for yourself driving one of these vehicles. We all respect those who own the best cars on the planet. Cars have grown to be used as status symbols in society. When you want to import and searching for used luxury Rolls Royce, the beautiful Bentley or stylish Range Rover from UK. Our UK Auto Export service will offer you many things in a single package. First on the list is the safety and prestige. However, these cars offer the best of beauty and comfort in a single package. You will have your Audi to thank for the ability to cruise for hours while turning heads and arriving feeling fresh and ready to take on the world on your own terms. With our used luxury cars for export, you get to experience the very best of materials from the car. You have genuine leather, great wood and other premium parts. While they offer you the feeling you need to feel like a royalty, they also give you a chance at safety. When your car has steel doors and premium glass that will not shutter easily when hit, you are assured of your safety. All the cars we sell come with the very latest of technology features that will make your trip great. All the prestige used cars export from UK are assured to give you the comfort you deserve. The best entertainment facilities, best air conditioning and even some come with the ability to have your favourite drink as you take your trip. We make sure the facilities are in working condition before we can add the cars to our list. The prestige Rolls Royce, the classic Bentley and stylish Range Rover come with the assurance of receiving full service & maintenance from main dealers. All vehicles we offer for export, come with an assurance of full service history and maintenance record. These used vehicles we export from UK are very economical to maintained anywhere in the world. UK Auto Exporters can help you finding the right spare parts for these used cars from UK. When you import one of the used Rolls Royce or used Bentley from UK through UK Auto Exporters, you can easily customise it to your own preferences. We can recommend a list of firms that specialise in the customisation of these vehicles. These companies can overhaul any car as per your recommendation. Most of the new and used luxury cars we export come with high performance powertrain. 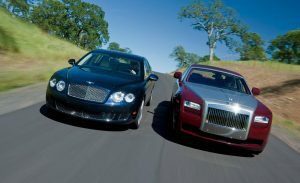 The used luxury Rolls Royce and Bentley come with the best performance features possible. You will accelerate like a rocket and perform other stunts other cars will not be able to do. The cars we offer to export, we always verify the performance of these cars before exporting. If you import a used luxury car from uk, we assure you will have a car that lives up to its name. First of all, if you knew the quality and performance of German Audi, BMW & Mercedes and luxury of British Rolls Royce, Bentley & Rang Rover, then that is exactly what we will deliver you at your door step.